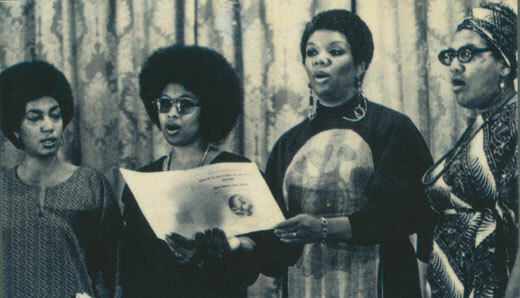 From left to right: June Jordan, Alice Walker, Lucille Clifton and Audre Lorde sing together at the Phillis Wheatley Poetry Festival in 1973. The Manuscript, Archives, and Rare Book Library also holds Alice Walker's literary collection. Treasures from the archive of the late poet Lucille Clifton, including rare unpublished poems and some of her earliest children's books, will be featured in upcoming exhibits from the Manuscript, Archives, and Rare Book Library (MARBL) at Emory University. The first exhibit, titled "come celebrate with me: The Work of Lucille Clifton," opens Aug. 28 in the MARBL Gallery on Level 10 of the Robert W. Woodruff Library. Curated by Amy Hildreth Chen and Kevin Young, it features poems—from the first she ever wrote in the 1950s to her last in 2010—limited edition books and previously unseen photographs, from Clifton's childhood to her National Book Award win in 2000. The exhibit coincides with the release of "The Collected Poems of Lucille Clifton 1965-2010," co-edited by Young, a poet and professor of English and creative writing at Emory as well as curator of literary collections and the Raymond Danowski Poetry Library at MARBL. The book contains more than 700 pages of Clifton's poems, including 62 unpublished poems — 27 from her early years of writing, 35 from her later years until her death two years ago. The poems were found in Clifton's papers, which MARBL acquired in 2006 and added to after her passing. The Buffalo, N.Y., native, whose first book of poetry was published in 1969, is best known for her distinctive lowercase style and poems such as "homage to my hips" and "won't you celebrate with me." Her powerful, pared-down poems describe her experience as an African American woman in the 20th century, some told simply yet profoundly, others with earthy humor. She became well known through her appearances on television shows such as "Nightline" and Bill Moyers' "The Power of the Word." Her writing has been published in more than 100 poetry anthologies. 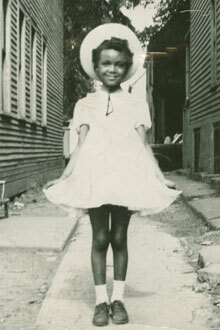 Lucille Clifton as a child. Photographer unknown. Circa 1940s. A smaller companion exhibit of Clifton's children's books called "She Sang So Sweet: Lucille Clifton's Children's Literature," curated by Chen, will run in the Concourse Gallery of Woodruff Library, near the main entrance on Level 2, beginning in mid-September (check the library website for updates). It will include one of Clifton's first books and her unpublished compilation of jump-rope rhymes, which inspired the display's title. "Clifton was primarily known as a poet, but she had an entire second career as a children's book author," says Chen, a doctoral candidate in English and Young's research assistant. Many of the books feature children facing social or emotional issues, particularly her popular Everett Anderson series—eight books written between 1974 and 2001 that focus on an African American boy living in a big city. Clifton and Young developed a friendship over the years after Clifton selected Young's first book for publication as part of the 1993 National Poetry Series. The two got to know each other at a writer's conference years later, and Clifton came to Emory as a guest reader in the Raymond Danowski Poetry Library Reading Series in 2006, the same year MARBL acquired her papers. A National Book Award winner, Fellow of the Academy of Arts and Sciences, Emmy Award winner, Chancellor of the Academy of American Poets, mother, memoirist, "Jeopardy" champion and national treasure, Clifton was at the height of her poetic powers when she died in February 2010 after a long illness. Young says he hopes viewers of the exhibition will come away with a sense of Clifton's enduring spirit, especially in the face of disease and loss. "Like the poem ‘won't you celebrate with me,' it's a triumphant feeling," he says. The last poem Clifton ever wrote, called "In the Middle of the Eye," is part of the exhibition. "It's a really powerful thing to see it in her handwriting," he says. "It's about being brave in the face of everything. I think a lot of her work is about that."